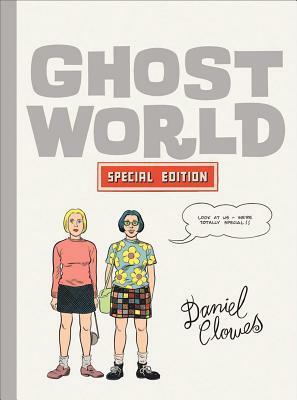 To commemorate the tenth anniversary, Fantagraphics Books released this deluxe, expanded Ghost World special edition in 2008, combining the original graphic novel, the Oscar-nominated screenplay adaptation by Clowes and Terry Zwigoff, as well as over two dozen pages of rare and obscure bonus material in one book, along with a new cover and introduction. Ghost World is the story of Becky and Enid, two teenaged girls and best friends facing the prospect of not only growing up, but growing apart from each other. Clowes paints a tender picture of this intellectually precocious, sexually adventurous (despite a mutual lack of experience), and formative period in their lives, filtered through a blue hue echoing a world lit by the cathode rays of a television -- a perfect metaphor for their post- nuclear existence. Both naturalistic and nostalgic, Ghost World carves a layered narrative out of the daily existence of these fully-realized young women. Ghost World: The Special Edition included the original, 80-page graphic novel; the out-of-print, Oscar-nominated 106-page screenplay; the little-seen comic strip created for the Ghost World soundtrack; and over 30 pages of rare ephemera related to the book and film, including covers to foreign editions of Ghost World, rare promotional art, pictures, sketches and much more.